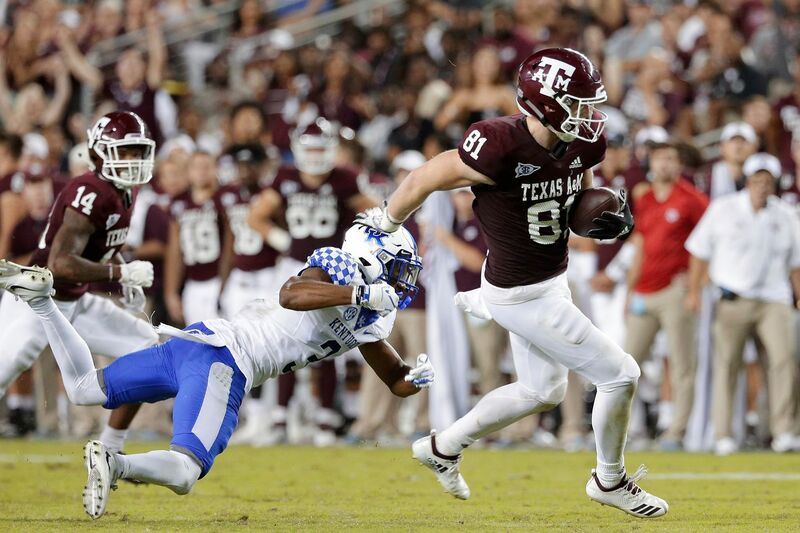 Texas A&M tight end Jace Sternberger (81) breaking a tackle attempt by Kentucky safety Jordan Griffin (3) as wide receiver Camron Buckley (14) looks on during an October game. He is analyzing the 2019 NFL draft for The Inquirer, breaking down the best player, the riser and the sleeper at each position. Today, in part 5 of our series, he looks at three tight-end prospects. Iowa tight end T.J. Hockenson catching a pass at the NFL combine. Ben’s take: “Every NFL team is looking for that tight end that not only can catch the football but can survive in the trenches, that can block in the run game and seal off defensive ends as well as stretch the field vertically and be red-zone savvy. The next George Kittle. The next Rob Gronkowski. “When you can put your tight end on a 270-pound defensive end, it allows you to allocate more offensive linemen to double teams and maybe [exploit] mismatches of their own, getting them on safeties and linebackers on the perimeter or the second level. “Having a tight end like Hockenson who can block changes your offense. He’s a very good inline, point-of-attack type tight end. Plays with great leverage. Runs to speed on contact. Can pancake-block D-ends and linebackers and safeties. He’s just an annoying guy to play against. Ben’s take: “I did the A&M-Mississippi State game last year [with ESPN]. Mississippi State’s defensive coordinator, Bob Shoop, circled this guy on their depth chart. He said, ‘This is the guy we have to stop. This is their Zach Ertz.’ That’s a pretty good description of what kind of player he is. “He was an inline tight end for A&M, but isn’t really an NFL inline tight end. He’s not a point-of-attack blocker. But he can run vertical routes and win in the intermediate parts of the field. Trevon Wesco of West Virginia catching a pass during practice for the Senior Bowl in January. Ben’s take: “He had a great week at the Senior Bowl, but wasn’t a big part of West Virginia’s passing game last year. They used a lot of ‘10’ personnel [1 RB, 0 TE, 4 WR], so he wasn’t on the field a lot. Caught just 26 passes. Was used on very simple routes. Pop passes, things like that. So people are questioning what he can do at the next level. But he’s someone who has a chance to be a better pro [than he was college player]. “Projection is a big part of the draft process with guys like Wesco. There are just things he wasn’t asked to do in college. It’s not that he can’t do them. He just wasn’t asked to do them. So teams have to figure out whether he can do them at the next level.